AgroAtlas - Crops - Zea mays L. - Corn, maize. Zea mays L. - Corn, maize. Ssp. tunicata Sturt. - pod corn; the original cultivated variety; ssp. amylaceae Sturt. - soft or flour corn (71.5-82.7% starch and up to 12% protein per kernel); ssp. everta Srurt. - popcorn; upon heating, kernels explode, forming flakes 15-20 times the original volume; ssp. indurata Sturt. - flint corn (up to 76% starch and up to 13.5 % protein per kernel), very plastic; ssp. indentata Sturt. - dent corn, hybrid of soft corn and flint corn; ssp. semidentata Kulesch. - semident corn ssp. saccharata Sturt.- sugar corn with sweet kernels used for canned food; ssp. amyleosaccharata Sturt.- soft-and-sugar corn; limited cultivation areas (Peru, Bolivia); ssp. ceratina Kulesch. - waxy corn; has a waxy endosperm, starch is tinted reddish brown. Classification proposed by All-Union Plant Cultivation Institute staff includes 5 main subspecies: ssp.everta (Sturt.) Zhuk. - popcorn, ssp. indurata (Sturt.) Zhuk.- flint corn, ssp. amylacea (Sturt.) Zhuk. - soft corn, ssp. indentata (Sturt.) Zhuk. - dent corn, ssp. saccharata (Sturt.) Zhuk. - sugar corn. Waxy corn and pod corn, treated earlier as subspecies, are actually mutant varieties of soft corn and flint corn. Sugar corn is also a one-gene-su1 mutant but did not retain the subspecies rank, as it has its own range of population and is very old in origin. 2n=20. Annual herbaceous cultivated crop. Anemophilous, monoecious plant with diclinous inflorescences and an upright, cylindrical, leaf-bearing stem ranging in height from 50-80 cm to 5-6 m. Maize features a powerful, well-developed root system. The number of internodes and leaves vary greatly depending on growing conditions and plant genotype. Large, ribbon lanceolate or large lanceolate leaves, ciliated at the edge, grow from opposite sides of the plant in an alternating pattern; the leaf sheath is open, with a ciliated lingula. Spikelets are unisexual; male and female ones are bunched in different inflorescences. Staminate (male) flowers are borne on the tassel terminating the main axis of the stem. The tassel consists of many pairs of lanceolate spikelets 6-8 mm long situated along the branches of the tassel. Spikelets have one, two, rarely three flowers. One of each pair of spikelets has an elongated stalk; the other is sessile. Pistillate (female) flowers - the cob (each plant bearing 1-2, rarely 3 cobs) is up to 45 cm long - take shape inside leaf collars. Along the rachis of the cob, there are vertical rows of 4-48 spikelets with pistillate (female) flowers. Each spikelet consists of a pair of flowers (florets), but only the upper one is subject to development. Ovary is superior, sessile, unilocular with one seed-bud. Style is very long, filiform with a bilobar stigma on top. The fruit is a caryopsis of different consistencies (from mealy to hyaline), of different sizes and colors. The average number of kernels per cob is 500-1000. Maize is a spring, heat-loving crop( seeds germinate at 10°C; young crops survive morning and night frosts of 2-3°C; in autumn, morning and night frosts ruin young plants). It is light-demanding and quite drought-enduring. The growing period usually lasts 90-150 days. Maize is fastidious about soil. Upon application of organic and mineral fertilizers, maize yields a good harvest in black, gray-wooded, chestnut and derno-podzolic soils with a deep humic horizon, good water retention and water permeability. The optimal soil pH level is 6.6-7.7, and the soil weight is 1.1-1.3 g per cm3. Since it takes about 25 kg of nitrogen, 9 kg of phosphorus and 20 kg of potassium to form 1,000 kg of maize kernels, the plants should be supplied with these substances during the whole vegetation period, but they need them most at the stage of ear-formation, florescence, and kernel formation. Cultivars and hybrids of different maturity classes need a rigidly defined total of active temperatures (from the stage of sprouting to that of full kernel maturity). So, the early-maturing group requires a total active temperature of 2200°C, the middle-early one requires 2400°C, the mid-season one requires 2600°C, and the middle-late one requires 2800°C. Maize is one of the oldest plants incapable of self-seeding and of running wild. Native to Central and South America. First cultivated in what is now Mexico by the ancient Maya and Aztec (about 5,200 B.C.). The most common opinion is that maize originated through domestication of the wild grass teosinte (Euchlaena mexicana), which is native to Mexico. Others consider pod corn the original variety. Imported to Europe in the late 15th century. In Russia (Georgia), maize has been cultivated since the 17th century. The area of maize cultivation starts at 58°N latitude and reaches 40°S latitude. Maize is widely cultivated in the USA, Brazil, Mexico, southern and southeastern Europe, Southeast Asia, and South and East Africa. In Russia, main maize-producing areas are the Volga region, Northern Caucasia, the Central Black Earth Belt, the Urals, and Siberia. Among the former Soviet Union Republics, the Ukraine, Moldavia, and Kazakhstan have the largest areas sown with maize. In 2004, there were over 350 maize hybrids and lines distributed among the regions of the Russian Federation. 114 of them are grown for their kernels, 136 are grown for general purposes, and 42 are grown for silage. Principal hybrids include Almaz, Barbados, Belozerny 1, Galina, Evrostar, Kaskad 195, Kollektivny 181, Krasnodarsky 194, Krasnodarsky 200, Kubansky 247, Libero, Newton, Obsky 150, Ross 144, Ross 191, SZTK 191, and others. Maize is a valuable cereal, food and fodder crop. In 2001, the area sown with maize for cereal production on all kinds of farms in the Russian Federation totaled 683,000 hectares (1.4% of the total cereal crop area). Maize kernels are rich in carbohydrates, while their proteins are poorly balanced (about 20% of proteins are contained in the germ and 80% in the endosperm). The germ contains protein of well-balanced amino-acid composition, while the endosperm contains the bulk of proteins, including glutenin and zein. The latter is a highly unbalanced protein almost completely devoid of lysine and tryptophan. Due to the high zein content (up to 35-60%), which almost completely lacks indispensable amino acids, the biological value of maize protein is extremely low. 100 g of protein of common cultivars contain 1.8-2.5% lysine and 0.08-0.09% tryptophan. Breeding for high and low protein content in the kernel yields good results: selection after 70 generations yielded 26.6% (Illinois high-protein line) and 4.4% (Illinois low-protein line) protein in the kernel. Breeding for high protein content does not improve the quality of its composition. Kernel contains 4-6% oil (up to 40% in the germ) and 65-70% carbohydrates but is poor in B-vitamins (pellagra frequently occurs in areas where maize is the staple food-stuff). Maize is used in flour-milling (flour, cereals), for food (corn oil, flakes, snacks, etc. ), in the starch and syrup industries and in brewing and distilling spirits. Maize kernels provide concentrated fodder and raw materials for feed mill industry. 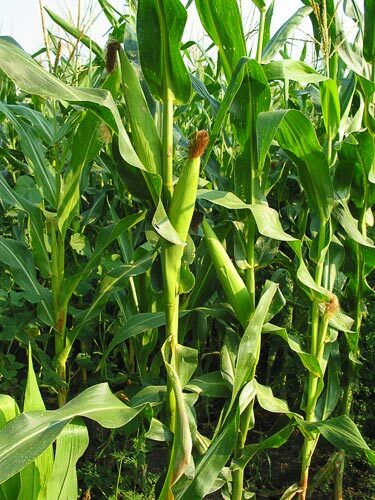 Maize green material (containing, in different stages of maturity, 13.6-14.6 g of digestible protein and 0.183-0.393 fodder units per kilo), maize silage and maize ears (with kernels) ground and preserved at the stage of their milky-wax ripeness are valuable fodder. Maize stems, cobs and their husks are used to manufacture paper, linoleum, viscose, insulating materials, etc. Pistil stigmae are used in medicine. Maize is grown as part of field and fodder crop rotation. Maize precursors are winter cereal crops, leguminous plants, tilled crops, and spring wheat. Maize is sown in square holes or rectangular holes with row-spacings of 60, 70, 90 and 140 cm and with a distance between holes of 70 cm. Single grains of maize are sown in fields free of weeds. 20,000-60,000 maize plants are planted per hectare when they are grown for their kernels or for silage, and 150,000-200,000 plants are planted per hectare when they are grown for green fodder. Planting depth is 6-12 cm. Maize is gathered when its kernels are fully mature. When grown for silage, it is gathered at the stage of milky-waxy ripeness. Maize yields 2,000-3,000 kg of kernels per hectare; on the best farms, it may even yield 5,000-6,000 kg of kernels per hectare. It yields 17,000-18,000 kg of green material per hectare and 30,000-60,000 kg of green material per hectare on common and best farms, respectively. Main breeding agencies include the All-Union Research Institute of Maize, the All-Union Research Institute of Sorghum and Other Cereal Crops, the Krasnodar P.P. Lukyanenko Research Institute of Agriculture, the Russian Research Institute of Sorghum and Maize, and the Samara N.M. Tulaykov Research Institute of Agriculture. Main maize cultivation areas are subject to intensive growing technologies such as early spring land leveling, application of weed-killers, sowing, inter-row tilling simultaneous with weeding in rows, harvesting, harvest crop processing and its preparation for storage. Early spring land leveling creates favorable conditions for fast heating of land in the spring, for a uniform distribution of weed-killers and for simultaneous sprouting. Weed-killers are applied to protected areas of the future rows (band application). They are covered up immediately after that. Maize is sown when the soil temperature at seed-sowing depth is 10-12°C. The rows of maize are sown in the middle of the bands treated with weed-killers. The crops are harvested by combined harvesting teams formed around combine harvesters and transport units. These teams gather crops from a field in 2-3 days. Treatment of gathered ears, kernels and silage material (its ensilage) is carried out while harvesting, which greatly reduces losses in harvested crops. As compared to traditional, intensive technologies, such methods increase maize kernel yield by 1,000-1,200 kg per hectare. Cherepanov S.K. 1995. Vascular Plants of Russia and Neighboring Countries. St. Petersburg, p. 762. Cultivated Flora of the USSR. 1982. Vol. 6: Maize. Moscow. Maize and Sorghum. Journal. 2004. Vols. 4-6. Moscow. Mukhin A.A. 1984. Industrial Technology for Maize Cropping. Moscow. Shmarayev E.G., Vedeneev G.I., Podolskaya A.P., Banayants A.F. 1995. Genetics of Quantitative and Qualitative Characteristics of Maize. St. Petersburg. State Register of Approved Breeding Achievements. 2004. Moscow. Zhukovsky P.M. 1971. Cultivated Plants and Their Congeners. Leningrad.